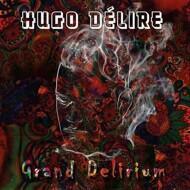 After few acclaimed freestyles on the web (almost 1 million views) and the release of a first EP in late 2013, Hugo Délire aka HD turns up with his first album, “Grand Delirium”. Between screeching humour, clever lyrics and driving productions, HD rap is considered to be technic, clever, stupid, uncommon, literary ... but above all it’s a breath of fresh air. Supported by a A-list of French kickers : Nekfeu, Hippocampe Fou, Lomepal, Yoshi, Gaïden ... Hugo Délire aligns assonance on alliteration and offers a a first striking and assertive album.